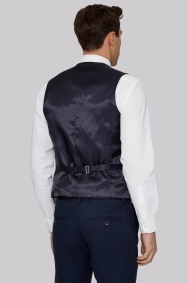 Open the window of opportunity with this striking blue waistcoat. 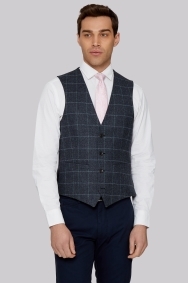 Strike all the right style notes at your next smart casual event with this stunning windowpane waistcoat from our Moss 1851 range. Tweed inspired and terrifically tailored, this is a form-flattering piece cut from 100% wool to keep you looking luxe from the off. The pattern is bold and colourful, making this an impactful yet versatile addition to your everyday wardrobe. Perfect for a modern gent striding it out across the city or kicking back in the countryside. Wear with a crisp white shirt and iridescent pink tie for a classic ensemble with playful flourish. Great quality product. Looks even better in real life than in the picture.